The Five Marketeers (from left) Nick Damato, David Kwok, Rachel Phan, Justin Hopp, and Jorge Figueroa. 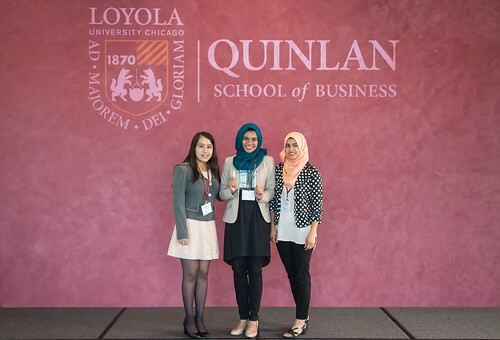 For the first time, an all-freshman team emerged triumphant at the Quinlan Case Competition, a contest that puts undergraduate students’ problem-solving skills to the test before a panel of Loyola alumni and business leaders. The group of Quinlan Honors freshmen, who called themselves the Five Marketeers, believed they had the talent to win, but knew they had to overcome their lack of classroom and internship experience to do so. The team—Nick Damato, Jorge Figueroa, Justin Hopp, David Kwok, and Rachel Phan—spent their fall break working around the clock to prepare for the competition. Participants were given just four days to create a real-world business solution for a case focused on self-driving autonomous vehicles for Google. The Five Marketeers competed against more than 60 students from 17 teams during two rounds of judging by Quinlan alumni and members of the dean’s board of advisors. Participants spanned all years from freshman to senior, and included students from the Quinlan School of Business, College of Arts and Sciences, School of Communication, and Marcella Niehoff School of Nursing. The following teams were awarded cash prizes for their insights and recommendations. Case competition organizers intentionally selected a very current case for students to work on. “We knew that students already had a relationship with Google, and they were interested in the technology behind the autonomous car,” says Amy Kyhos, senior lecturer and faculty lead for the Quinlan Case Competition. Teams were asked to determine if the self-driving autonomous vehicle was worth Google’s investment, considering competition from auto manufacturers already developing self-driving cars, and the legal and ethical concerns around self-driving cars. Based on their recommendations to continue or cease development for the autonomous car, students determined how the car aligned with Google’s corporate mission of organizing the world’s information. After the preliminary round of competition, three teams remained—The Five Marketeers, Think Tank, and Business Majors. The three finalist teams presented their cases to the panel of judges in a Wintrust Hall packed with students, faculty, and staff. The teams had 10 minutes to present their final recommendations to the judges. After the presentations were done, the teams had a 10-minute Q&A session from the judges. All three teams were confident in their recommendations for how Google should proceed with plans for a self-driving autonomous car. But the judges felt one team rose above the rest—the Five Marketeers. The Case Competition teaches business skills, as well as soft skills necessary for professional success. “This experience is very similar to situations that students will face in their careers, but provides a safe environment where students can hone their skills,” says Alex See, student services coordinator and staff lead for the Quinlan Case Competition. The Five Marketeers agree, and encourage others to participate in case competitions to further develop the communication, presentation, problem solving, and critical thinking skills needed in business. “This experience has given my team and me the confidence to get involved on campus and express our ideas about the issues facing the business community,” says David Kwok. View event photos in the gallery below or on Quinlan's Flickr page.